Princeton Architectural Press, 9781616895303, 176pp. Stone Barns Center for Food and Agriculture is on a mission to create a healthy and sustainable food system that benefits us all. A nonprofit organization, Stone Barns Center works to develop a culture of eating based on what farms need to grow to build healthy soil and a resilient ecosystem. In its quest to transform the way America eats and farms, the organization trains farmers, educates food citizens, develops agroecological farming practices, and convenes change makers. Stone Barns Center, 25 miles north of New York City, is home to the celebrated Blue Hill at Stone Barns, under the direction of chef and co-owner Dan Barber, a multiple James Beard award–winner. 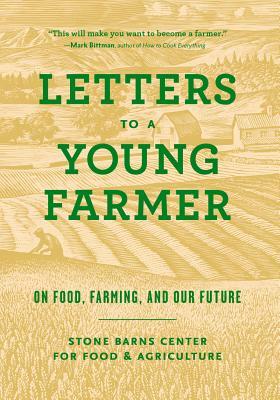 "This collection of letters from three dozen of the most respected figures in agriculture today-farmers, chefs, writers, philosophers, and activists including Joel Salatin, Temple Grandin, Wendell Berry, Karen Washington, and many others-draws on their collective wisdom to answer a single question: "What would you say to young people just starting out to farm?" The answers are equal parts educational and informative and offer wise reflections on how to grow healthy food in ways that treat land, animals, and people with respect." "This book is a good read and has a feel-good message. It provides a nice overview of the many of the themes of the local, small, diversified farming movement.The essays are generally short, easy to read, and thought provoking. I recommend the book to its intended audience and to anyone who wants an overview of the many writers in the food movement have to say." "The 38 letters and essays in this inspiring book are a must-read for new and aspiring farmers. It is also important that consumers and those who make use of high-quality food in their restaurants and other food-related businesses read these letters. Non-farming readers will better understand the challenges faced by new farmers and appreciate that most farmers who produce high-quality food with sustainable farming practices are underpaid and sometimes undervalued for their wonderful produce and their sustainable stewardship of farmland."